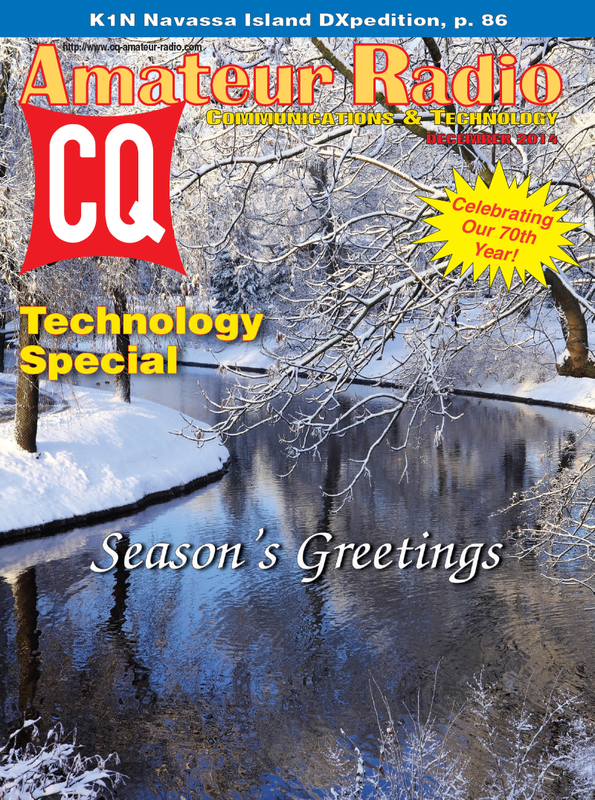 Once again, the December issue of CQ features our annual Technology Special, with an eclectic mix of articles this year, ranging from receiving satellite telemetry and transmitting high-definition amateur television to using CW software tools and using Internet-connected receivers to make QRP CW contacts even when propagation is not your friend (propagation was a great friend to 10-meter operators during October's SSB weekend of the CQ World Wide DX Contest, and it's the subject of December's editorial and Propagation column). Speaking of contests, we've got the rules for the 2015 CQ WW 160-Meter Contest, which will be run on January 23-25 (CW) and February 27- March 1 (SSB). We also have the rules for the 2015 CQ DX Marathon, which again includes the Limited Class competition category, which was introduced for 2014. Remember, the 2014 Marathon ends on December 31 and logs must be submitted by January 10, 2015. 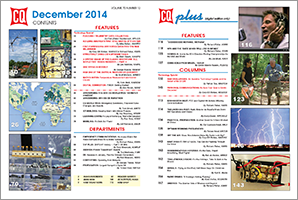 In a follow-up to November's listing of changes in CQ award rules to add new categories for remote operating, we also have revised rules for the Worked All Zones (WAZ) award, which had not been finalized a month ago..
We also have our annual index in this issue, for quick reference to every article that appeared in CQ during 2014, including those articles that ran in the digital-only CQ Plus supplement. An updated Master Index from 1980-2014 will be posted here on our website in the near future. Among December's columns, our technology focus continues with "Math's Notes" editor Irwin Math, WA2NDM's, look at temperature measurement and control circuits; Digital Editor N2IRZ's "getting started" guide to PSK-31, and Kit-Building Editor K0NEB's tips on "Keeping Warm with Winter Projects." VHF-Plus editor Tony Emanuele, WA8RJF, starts up a series on the history of the VHF/UHF ham bands, beginning at the bottom with 6 meters. We also have the announcement of next January's DXpedition to Navassa Island (#2 on DX magazine's "most wanted" list) and of a new CQ DX Editor in the December DX column. In December’s CQ Plus – the expanded CQ digital edition – Gerry Dexter, WPC9GLD, reports from his Listening Post that Radio Exterior de España has shut down shortwave operations and closed its Nobeljas transmitter site. Meanwhile, people at the American Forces Network reflect on “Good Morning, Vietnam” and the recent death of Robin Williams. Can you imagine being on duty at commercial Pacific Coast radio station KPH on the morning of December 7, 1941? The Marine Maritime Historical Society opens the station’s logs for the first time in decades. Homing In expert Joe Moell, KØOV, gives details of the 2014 Direction-Finding Championships. ALSO: Flash back to 1924-’25 when listeners in Brazil leaned into their receivers to chase KDKA on shortwave. Yes, shortwave! Readers get the latest on “Assistive Technology” and the return of the ATOM from Ham Radio Challenges’ Patrick Tice, WAØTDA. Practical Propagation’s Carl Luetzelschwab, K9LA, embarks on the chase for another 5-Band Worked All Zones award. Cory GB Sickles, WA3UVV, in Off the Air asks: “Does This Antenna Make My Radio Look Big?” And then follows in Personal Communications with a focus on the importance of station grounding. Looking to the Communications Horizons, Rob de Santos, K8RKD, says, “It’s the data, stupid!” when advertising meets digital. December’s Radio Drama finds young Ryan Archer, KCQ6KPH, in his late great-grandpa’s radio room on a magical “Nostalgic Holiday Evening.” Speaking of the holidays, stumped about what gift to slip yourself under the tree? Get a review of the hilarious Bill Bryson tale, A Walk in the Woods, in Trail-Friendly Radio. 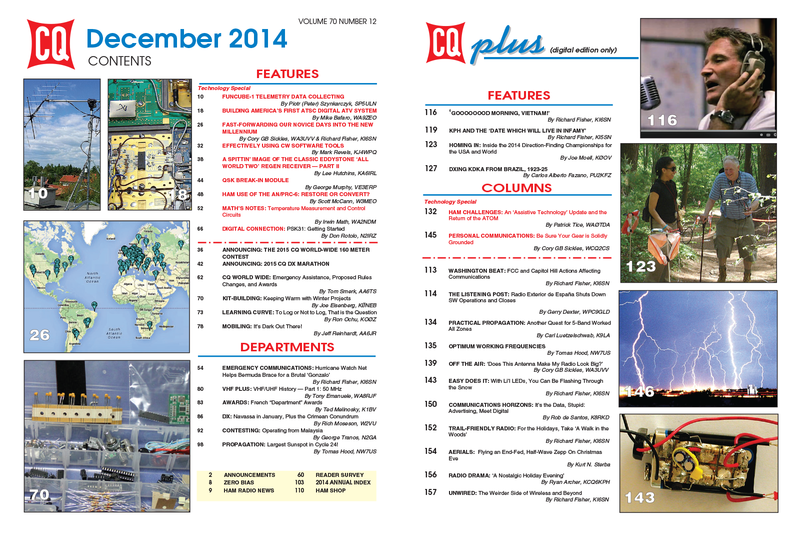 That's a brief look at what's coming up in the December issue of CQ and CQ Plus. For information on becoming a CQ subscriber, click here! Happy holidays from all of us at CQ!